Grave marker for Woodrow W. Millsaps in Section 2 Site 279 of the Fort Mitchell National Cemetery, Fort Mitchell (Russell county) Alabama. Woodrow enlisted in the Army in the late 1930's and appears in the 1940 Census as a Sergeant, living in the same barracks as Royal Taylor, at Ft. Benning, GA. The unit designation was not recorded. In April of that same year, Sergeant Taylor was called to the Parachute School to meet with Major Roy Lindquist, his prior commander when he had been in B Company, 29th Infantry. Lindquist offered him the 1st Sgt role for a new unit to be formed. Millsaps apparently declined the job but was soon sent to OCS and graduated as a 2nd Lt. in December 1940. 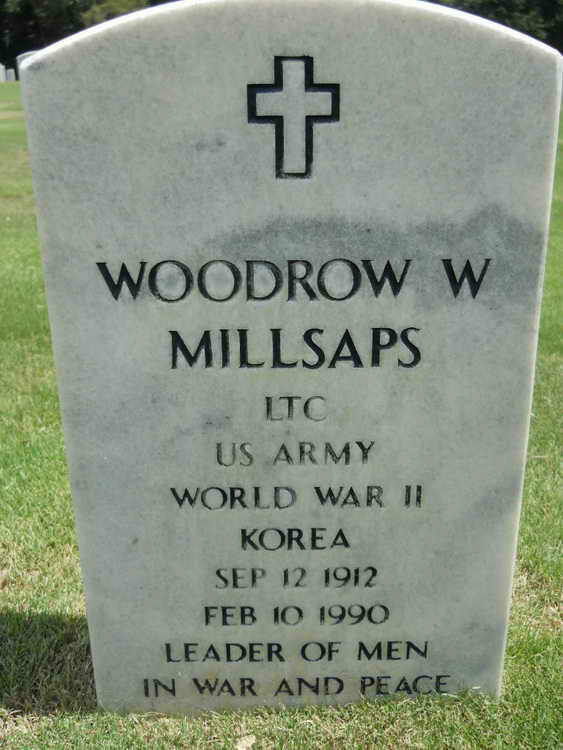 1st Lt Millsaps jumped into Normandy and Holland. Between the two campaigns he earned the Silver Star with Oak Leaf Cluster. He also was awarded the Combat Infantryman Badge and the Bronze Service Arrowhead Device, both for action during Normandy, France Campaign, 6 June 1944 to 9 July 1944. He was promoted to Captain on 20 November 1944. He also saw duty during the Korean Conflict and 18 Nov 1950 he was "Seriously wounded in action by missile". He was able to return to duty on 12 December 1950. Lt. Col. Millsaps retired on 30 April 1957.